Mike Vrabel was a 3rd round pick of the Pittsburgh Steelers out of Ohio State in 1997, where he played primarily on special teams and as a backup linebacker. He joined the Patriots in 2001 and became a key contributor to New England’s underrated defense starting at left linebacker. He’d also see time at ROLB and RILB. Vrabel earned an AP and Pro Bowl nomination for his 2007 season when he made a career high 12.5 sacks, 55 tackles, and 4 forced fumbles. He played his final two seasons in 2009 and 2010 for the Kansas City Chiefs. Mike also moonlighted as a tight end for the Patriots and Kansas City in goal line situations catching 14 passes for 10 touchdowns. 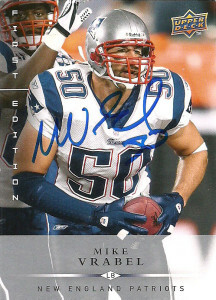 In 2011, Mike returned to his Alma Mater Ohio State where he was hired as their linebackers coach. He served in 2012 and 2013 as the Buckeyes defensive line coach. When Bill O’Brien became head coach of the Houston Texans in 2014, Vrabel moved in to serve as the team’s linebackers coach. He received a lot of exposure in 2015 on HBO’s Hard Knocks shaping the team’s chippy middle four, and turned Whitney Mercilus into a double digit sack threat by the end of the season. After the 2015 campaign, the San Fransisco 49ers offered Vrabel their defensive coordinator position, but he declined the offer and remains on the Texans staff for the 2016 season.